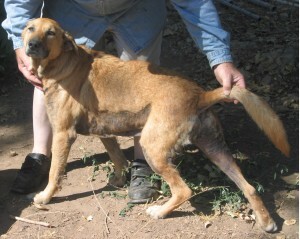 This is ‘Margie’ a 7 yo Shepherd Mix, spayed, farm dog. note the loss of hair, discolored skin. There are many differing opinions as to the causes and treatments of what is now called an Epidemic of Canine Skin Disorders, the Itching, Scratching and Chewing commonly referred to as “Summer Itch Hot Spots”. These dog skin rashes are generally known as Hot Spots because these skin disorders are often associated with warm weather. Hot Spots are often diagnosed as Eczema, Pyoderma, Seborrhea, Allergies to Fleas / Foods / Grass / Mold /or other Environmental Substances, Pemphigus, Atopic Acral Lick Dermatitis, Auto Immune Disorders, Thyroid problems, Staph and Yeast Infections, and other skin disorders. Margie’s other side, she was pretty miserable at this point in time. Margie’s belly, would YOU want to rub this tummy? Itchy “Hot Spot” skin conditions MUST not be confused with Mange or Flea infestations or Ringworm Fungus and hair loss caused by Hypothyroidism, Cushings disease, Genetically predisposed pattern baldness, Rabies vaccine induced ischemic dermatopathy bald patches, and hormonally caused coat problems as a result of neutering are not “Hot Spot” itching and scratching! Demodectic Mange and Sarcoptic Mange are Parasitic Mite Infestations and can be diagnosed by skin scrapings. Fleas and Mange can be successfully treated with Insecticides. Ringworm is not a worm, it is a fungus, causing itching, scabbing and hair loss in one or more areas on your pet. It is contagious and easily transmittable to humans and other pets. Treatment with a fungicide such as most athletes foot creams are usually effective. Demodectic (Red Mange) is caused by small mites found naturally on most dogs but do not generally cause skin problems unless the dog’s immune system will not naturally control them. This skin problem may be inherited because certain bloodlines in some dog breeds are more ‘prone’ to Demodectic Mange. Democectic Mange is not very contagious and is generally passed on to nursing puppies by the mother and is most noticeable around the eyes and mouth. Most breeders will not breed these dogs.Sarcoptic Mange (Canis Scabies) is very contagious and can be life threatening for the dog and can easily spread to other animals and humans. Steps must be taken to eradicate the infestation in the dogs entire environment as well as the dog and any other pets that may be exposed to the infestation. After two treatments, note hair regrowth! Legs still show some areas of hair loss, but she’s much better! Thyroid hair loss problems are not caused by itching, chewing, and scratching but by systemic hair loss, a type of Alopecia or Balding. There does not seem to be a consensus as to the cause of “Hot Spot” canine skin disorders but they do have a common set of symptoms. It appears that some dogs develop an itch so severe that the they chew and scratch and traumatize themselves to such an extent that this process causes open wounds, infections, loss of hair, and sometimes roughening of the skin (elephant hide). After 5th and final treatment, hair has pretty much regrown. She was feeling so good she was hard to hang on to! What a pretty tummy to rub! Margie lived until just shy of her 14th birthday, and NEVER had any skin issues again! The most common areas of irritation are around the back and tail, the abdomen, and the legs and paws. These symptoms seem to be more prevalent in warm weather and mild moist climates like the sun belt in the United States but are known world wide as far north as Alaska and as far South as South Africa and New Zealand. Research has shown this canine skin problem is world wide and affects many millions of dogs. Statistically, no one breed of dog appears more or less likely to develop “Hot Spots”, and mongrels are just as likely to develop a “Hot Spot” skin condition as is a pedigreed show dog. Age also does not seem to be a factor, puppies can develop “Hot Spot” skin problems as early as a few months of age, and geriatric dogs may suddenly show signs of “Hot Spots” when they have had no previous history of any type of itchy skin conditions. At this time there are a growing number of researchers that believe there may be a connection between the over-vaccination of the domestic dog population and the Epidemic of “Hot Spot” skin disorders. Quite often if a dog’s skin problems become more serious the dog may be ostracized by the family and even other pets as the skin problems become more visible and the dog’s skin may take on a very unpleasant odor. This can lead to the dog suffering serious depression that in turn aggravates the situation. Obviously, dogs feel the stress of being rejected in much the same manner as a human would. Unfortunately, many dog owners at this point in time, may be faced with the heartbreaking task of choosing to have their dog euthanized to end the dog’s suffering rather than continue expensive and painful treatments that have not been successful in controlling the dog’s skin disorder . According to a recent survey of Animal Control Facilities many dogs suffering from out of control skin conditions are brought to public animal shelters where they are considered to be un-adoptable and many thousands of dogs in these shelters are euthanized for this reason. Many other dogs are also euthanized by private veterinarians to alleviate the dog’s suffering under the same circumstances. Because of the different opinions as to the cause of this serious skin irritation problem, there are many different treatments prescribed by the Veterinary community. The first treatment of choice appears to be the Steroid Prednisone in an effort to temporarily relieve the itch and inflammation and perhaps an Anti-histamine. (The use of Steroids is a severe treatment and can result in serious negative side-effects, such as kidney failure, over an extended period of use). The next order of treatment is usually an Antibiotic or other treatment to fight infection because the dog has irritated the skin to such an extent that it is an open and infected wound. Analgesics and pain suppressing ointments may be provided as well. These treatments are only designed to treat the pain symptoms and infections and do not address the etiology of the problem or the cause of the itch. Some pain relief may be achieved but the itch remains and as soon as the pain relievers wear off the itch returns and the whole painful cycle begins again. Some Veterinarians believe that “Hot Spots” are the result of a Sensitivity or an Allergy to some substance. Allergy tests and treatments with antihistamines, changes in environments, and Special Diets, (including specially formulated dog foods, Raw Food Diets and supplements ) are often touted as the cure for “Hot Spots” but these treatments are inconclusive as to their efficacy and statistically these treatments do not appear to help with these skin problems. Over The Counter Remedies such as Medicated or Coal Tar Shampoos, Tea-Tree and Emu oil, Aloe Vera and other home remedies such as Turpentine, Petroleum Jelly, Mouthwash and Vinegar are all are basically part of a last ditch shot-gun approach to the problem that owners will often try in the hopes that ‘something’ will work. Some Flea shampoos will also further irritate open skin wounds. At this time there is no statistical evidence that any of the above treatments actually work to control the itch problem. While some temporary relief may be provided by some of these therapies, it is usually only temporary unless the itch syndrome is controlled. Many of these therapies can also be harmful and threatening to the dogs health. One can easily conjure up an image of a mad scientist, wearing goggles, a mask and rubber gloves, ‘treating’ an afflicted dog with useless shots, painful and dangerous chemical treatments, or shampoos so strong they advise against contact with human skin, then fitting the dog with plastic collars, taping the paws or putting on little gloves to prevent the dog from scratching and chewing itself raw. At this point you must ask yourself how you would feel if someone did that to you and then prevented you from scratching your itch? This 30% recovery rate WITH OR WITHOUT TREATMENT has given rise to a large industry of questionable Alternative methods of treating this painful canine skin disorder. These Alternative Treatments are unsupported by statistical or scientific method as to the efficacy of these treatments and are generally referred to in “Testimonials” with little, if any, testing to back up such claims. It is estimated that Americans spend more than $100 Billion Dollars a year struggling with these dog skin problems and it is also estimated that more than 50% of the total Veterinarian income in the Southern United States is derived from treating “Hot Spot” dog skin problems alone. However, don’t give up hope just yet! There are some recent scientific advances in research with statistical evidence which gives real hope that there may be some actual relief in the future for the estimated 100 million or more dogs world wide that suffer from this painful problem. This research is published and readily available on the Internet by typing in search terms as – ‘Canine Itch Treatment Research’ or ‘Alternative Dog Skin Treatment Research’ on any major search engine. Portions of this article were printed in the “Vet Gazette” section ofK9 Magazine’s Summer Issue, 2009, pages 70-71. 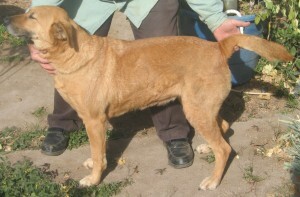 T.R.Talbott is a former breeder of AKC Labrador Retrievers and English Mastiffs. She lives in Sleepy Valley, CA. Since writing my article, several countries, including Australia, have taken steps to modify vaccinations for dogs and cats. Imagine if every time you went to the doctor you were given vaccinations that you don’t need; vaccinations that offer no benefit but all of the risks of harmful side effects. Or you were given medications with no explanation or information provided. Or tests were being done for no reason. Now imagine that you can’t speak and you have no way to tell those who care for you that those vaccinations make you feel sick; you don’t want those tests; and the medicine is causing more harm than good. That’s exactly what many of our cat and dog friends experience. We bring our best friend to the veterinarian with unquestioned trust and faith that our vet has our animal’s best interest at heart but according to Veterinarian Dr. James Busby, author of “How To Afford Veterinary Care Without Mortgaging the Kids”, his profession is suffering from a serious lapse in judgment and ethics that is rooted in making money. If you thought the veterinary world had escaped the ‘bottom line’ mentality of the Medical Community you are wrong. The world of veterinary medicine has become equally entangled with Drug and Insurance Companies. The result is not only rising costs for the animal guardian but also unnecessary treatments, over-the-top testing, and over vaccination for the animals. Veterinarians are great at using guilt and pressure to strip animal guardians of their power. They can be brusque, condescending and intimidating and in the end, the animal guardian, wanting to do whatever they can to support their animal friend, goes along with whatever the vet says. The only way to change this is for animal guardians to become as well informed about their animal’s care, as they are about their own. Until recently, Vets have held an unquestionable ‘high moral’ mark where guardians assumed that whatever a vet wants to do must be in the best interest of the animal, but that unquestionable morality is gone now. Let’s start with vaccinations. The standard operating procedure is for animals to receive a multitude of vaccinations on a regular schedule. Most animal guardians don’t question the vaccination schedule. If the vet says it’s needed, then it must be. For those who do question it, they are met with hostility or condescension or frightened with the horrors of what will happen if an animal isn’t vaccinated regularly. And in several cases, have been asked to find another vet altogether. But here’s the truth about all animal vaccines: The drug manufactures label determines the frequency of revaccination. There is nothing scientific about the current animal vaccination schedule. Neither the FDA nor the USDA requires drug companies to prove the maximum immunity conferred; they only require that immunity be conferred for the duration of their testing. Which means if the drug company tests for one year, the label states vaccinate yearly. This manufacturers’ recommendation ultimately influenced rabies laws in each and every state across the country. Those laws are not based in scientific study, but rather on the research done by drug companies necessary to get approval for their drugs. It has been proven as well that vaccine boosters do not increase immunity. Once the body has immunity, that same immunity will knock out the virus in the vaccine, leaving your animal to experience none of the benefits from the vaccine but all of the risks from the adjuvants; and, leaving the guardian to pay for something that does nothing. Kris Christine, Founder of The Rabies Challenge Fund Trust and vaccine reform activist, stated during a recent interview on Conscious Animal Radio that this practice fit the definition of fraud. Christine joined this fight when her own dog Meadow developed an injection site sarcoma with the needle mark visible in the center of the tumor. After her vet informed her that Meadow most likely had immunity to rabies for life, and carelessly let it slip that it was the distemper shot Christine should really watch out for as that one had many side effects and was ultimately unnecessary for older dogs, Christine jumped into action. Since, she has had the rabies vaccination requirement revised in her home state of Maine extending it to every three years; challenged the state to introduce a veterinary disclosure law, which was defeated and has started the Rabies Challenge Fund Trust along with Dr. W. Jean Dodds, a highly noted Veterinarian for her work and opinion on vaccine reform. The Rabies Challenge Fund seeks to prove through a challenge study that the rabies vaccine confers immunity for seven years. Dr. Ronald Schultz, who is also involved in the Rabies Challenge Fund, has already demonstrated through serology (blood testing) that the Rabies vaccine lasts at least 7 years. He’s also demonstrated that the distemper vaccine lasts at least 15 years; parvovirus at least 7 years and the adenovirus at least 9 years. By now you are beginning to see that there are two roots to this issue: The drug manufacturers who are not required to test for maximum immunity conferred and the veterinarians that go along with the recommendation of the drug companies without question. Another advocate for the animals is Dr. Bob Rogers. He has been challenging his profession for more than 15 years about the vaccination schedule and has numerous complaints raised against him by fellow veterinarians who claim his information is impacting their practice. Dr. Roger’s website (http://critteradvoc acy.org) offers insight, support and guidance for animal guardians trying to figure out what is in the best interest of their animals. Vaccinations are not the only area where Veterinary care has become more about the bottom line than about the health and wellness of the animal. Flea and tick prevention as well as heartworm prevention have added another layer of continual revenue stream for vets and the drug companies. Just recently, a direct mail company was promoting their services by citing the example of a veterinarian they had conducted a mail campaign for flea and tick preventative medication. The campaign occurred in December and the veterinarian was ecstatic that he had brought in $300,000 dollars in flea and tick medication sales in one month during the middle of winter. Topical flea and tick medications are neurotoxins designed to sever the nervous system of the fleas and ticks, hence killing them. If you read the package instructions you’ll find information to this effect: wash hands immediately should you come in contact with this product. How does that make sense? We put this product on our animal’s skin, but we are warned to wash immediately? The skin absorbs anything that is put on it. That toxin is drawn right into the bloodstream. In 2000, the FDA approved Pfizer’s NADA (new animal drug application) 141-152 for the drug RevolutionT (selamectin) which address fleas, ticks, heartworm, hookworms and ear mites all in one. This drug was tested for a duration of anywhere from 3 days to 10 months before receiving approval. Drug companies test to determine the effectiveness of RevolutionT, not to identify any long-term side effects of continuous use year after year. If side effects occur during testing, they are only a concern if the effect is wide spread; otherwise the drug is approved. In the case of the testing of RevolutionT, a number of animals in the clinical and field studies experienced vomiting, injection site hair matting and in a few cases developed anorexia. In 2002, the FDA approved Bayer Corporation’ s Advantage Duo® (imidacloprid/ ivermectin) for the use on dogs in the prevention of fleas and heartworm(see NADA 141-208). This drug was tested, at most, for 5 months and most tests consisted of once monthly application. Again the concern was demonstrating that the drug works, not identifying any possible long-term side effects from repetitive use over the many years of a dog’s life. Even more important to using pharmaceuticals to cure heartworm is using natural remedies to prevent fleas, ticks and other parasites from hosting on our animals. A healthy animal is less likely to be the host for parasites. A healthy animal requires a nutrient rich diet (no processed kibble) and natural support such as apple cider vinegar. Diane Stein, author of The Natural Remedy Book for Cats and Dogs, states that by simply adding apple cider vinegar to your animals diet daily, you will greatly boost the immune system and your animal will be less likely to have fleas or intestinal worms. One other area of concern is that of testing. It seems whenever we bring our animals to the vet, some sort of test needs to be done. According to Dr. Busby, many of these tests are unnecessary and not only cause your animal stress and anxiety but also cost you money you don’t need to be spending. In the case of testing for heartworm before administering heartworm medication, Dr. Busby says, ” Veterinarians imply that it’s dangerous to give the preventative to an infected dog. I am not aware of a product currently being used as a monthly preventive that can’t be given to a dog infected with heartworm.” He feels vets want to make a big deal out of discovering ‘heartworm’ so they can ‘cure’ it and charge you more. Dr. Busby also feels Pre-surgical screening prior to elective surgery is unwarranted. This screen entails a complete blood count and organ evaluation test prior to surgery. It could also involve x-rays and heart evaluation. His theory is that Veterinary medicine is indeed moving in the same direction of Human medicine with vets feeling the need to ‘cover’ themselves should anything go wrong. In short, Dr. Busby asserts that the majority of problems in surgery come from improperly administering anesthesia. If the vet is competent, the chances of complications are nominal and don’t warrant such over the top testing. Although veterinarians have enjoyed a long ‘honeymoon’ period, the honeymoon is officially over. Veterinarians have demonstrated over and over that they no longer deserve our trust and faith. For those vets that do have the best interest of your animals at heart, their response to your questioning and to your decisions for what is best for your animal should be one of understanding and support. For those that do not have the best interest of your animals at heart, a hostile response can be expected but should not be tolerated. As guardians to the animals in our lives, it is becoming more and more essential that we educate ourselves about the healing power of animals and that we understand that conventional western medicine strips our animals of their natural healing power. Seek natural solutions, feed a healthy diet and remember that all beings need a way to transition from their physical form. When our animal friend gets sick our initial reaction, which most veterinarians fuel, is to do whatever is possible to make our animals better. The greatest gift we can give our animal friends is respect of their process, which more often than not means letting them transition how they choose. When your animal came into your life, you made an agreement with them, whether you were conscious of it or not. That agreement: to be their voice and their advocate. You can no longer simply accept the word of your vet. You must do your research and educate yourself on what your animal truly needs to live a healthy, happy life. I believe in (and require my puppy buyers to follow) a very limited vaccination protocol for my puppies. This consists of specific vaccinations at specific intervals, designed to maximize protection and minimize risk. There is an incredible amount of information out there about vaccines and their side effects.. Often previously considered to be benign and harmless, now we are learning that we were wrong! Vaccines can have very many serious side effects, including autoimmune disorders, epilepsy, encephalitis, allergies, behavior problems, digestive disorders, cancer and death! With the Toller breed we have to be particularly careful, as their self-coloring and very limited gene pool puts them at a greater risk of vaccine-related problems than the average dog. The number one rule of my vaccination protocol is to NEVER give combination vaccines (a vaccine that contains more than one virus). The vast majority of vets give these combination vaccines only, so you will likely have to ask your vet to special-order your puppies vaccines for you. They may tell you its not possible to get a single-virus vaccine, don’t believe them! Many don’t want to order it in because it is more work for them! Galaxy makes the “Galaxy-D” single distemper vaccine; Intervet (Proguard), Vanguard and Duramune all make single Parvo vaccines. The all-to-common multi-virus vaccines tend to confuse to immune system rather than stimulate it. Many of these combo-vaccines contain anywhere from 5-8 different diseases! Where in nature would your dog be exposed to that many diseases all at the same time? You can only imagine the dog would have a very difficult time effectively fighting that many diseases at once! Just think about the stress on the dog’s immune system, and especially on a young puppy who’s immune system is still developing. Excessive vaccination can actually cause the immune system to cease working altogether. I call that the “I can’t handle it anymore, I quit!” response. Rule number two is limit the total number of vaccinations. There is no valid reason for giving the same vaccine over and over again to a puppy. The reason this practice was started is because puppies receive maternal antibodies from their dam while they are nursing, and these gradually wear off after weaning. But they wear off at different rates in different puppies, so we have no way of knowing for sure when they have worn off….it can be anywhere from 5-16 weeks, although the average is 6-10. Giving a puppy shots while it still has maternal antibodies is useless, as the maternal antibodies will “block” the vaccine and prevent immunity from being established. So vets in their infinite wisdom decided to give puppies vaccines over and over again so that eventually one will be given after the maternal antibodies are worn down. But since we don’t know when they were down, it could leave pups unprotected for several weeks, which is why vets will tell you to keep your young puppy off the streets and away from strange dogs until it “has had all its shots” at 12-16 weeks. So if we have to keep puppy isolated even if giving all these most-likely useless shots, then why do we both putting all that extra stress on the poor puppy’s system? Doesn’t it make more sense to not give those shots (since they likely won’t work anyway) and just be careful with puppy until he is a little older? Stay away from dog parks, pet stores and other areas frequented by large numbers of dogs until after 4 months old. Do your public socializing outside the grocery store, library, Home Depot, any place you can think about that has lots of people, but few dogs. Invite people over to your house to play with puppy, they can bring their adult, healthy dogs with them for playtime. Rule number three is choosing to only use vaccines that are actually needed in your area. Don’t give a vaccine simply because it exists. Every vaccine given to your dog places stress on the animal’s immune system and increases the risk of an unwanted autoimmune reaction. Parvovirus is an example of a disease that is very common and widespread and effects mainly puppies – therefore we may consider it to be a vaccine worth vaccinating puppies for. Also, the Parvo vaccine rarely seems to cause vaccinosis in Tollers. Now on the other hand, Distemper is another vaccine that always seems to be recommended – yet if you actually look into things, Distemper is essentially an unknown disease in many areas. I have talked to many vets that have never seen an actual case of Distemper in their practice. If the disease is not an issue in your area, then why vaccinate for it? Especially in the case of Distemper – this vaccine has been noted to cause a lot of side effects (vaccinosis) in Tollers, and I am very aware of the frequency of these reactions in the bloodlines I am working with. I do not recommend giving the Distemper vaccine unless truly needed in your area. Common side effects to this vaccine include temperament issues (fearfulness) , pitted teeth, belly rash, chronic itchy skin, and cystitis. Some of these are temporary problems, others have life-long effects. Rule number four is no annual boosters! The practice of giving annual vaccinations is a practice developed by the vaccine manufacturers, so that they will sell more vaccines. Vaccines don’t suddenly “expire” after a year, that’s just when the manufacturer’ s stopped testing the immunity. ONCE IMMUNITY TO A VIRUS EXISTS, IT PERSISTS FOR YEARS OR LIFE. There is no need to keep rechecking titers and revaccinating every 3 years or whatever. You cannot add more immunity to an already immune dog. It is not immunologically possible. All you are doing is increasing the risk of chronic disease….there is no benefit. The duration of immunity to infectious disease agents is controlled by memory cells, B & T lymphocytes. Once programmed, memory cells persist for life. Even in the absence of an antibody titer, memory cells are capable of mounting an adequate immune response in an immunized patient. A negative titer does not indicate lack of immunity, or the ability of a vaccine to significantly enhance the immune status of a patient. The USDA Center for Biologic and Therapeutic Agents asserts that there is no scientific data to support label claims for annual re-administration of modified live vaccines, and label claims must be backed by scientific data. It is the consensus of immunologists that a modified live virus vaccine must replicate in order to stimulate the immune system, and antibodies from a previous vaccination will block the replication of the new vaccinate virus. The immune status of the patient is not enhanced in any way. There is no benefit to the patient. The client is paying for something with insignificant or no effect, except that the patient is being exposed to unnecessary risk of an adverse reaction. According to Dr. Ronald D Schultz, head of pathobiology at Wisconsin University and arguably the world expert on this subject, once immunity to a virus exists, it persists for years or life. I am told that he vaccinated his own Golden Retrievers as puppies, and then didn’t vaccinate them again. He took yearly blood tests. 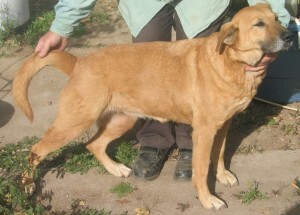 His Goldens are reported to have died naturally at around 15 years of age, and showed good antibody levels from the first booster until they died. Moral of the story: this and other research shows that annual shots are not necessary. Another interesting point on the vaccination issue is that your dog will in fact essentially be “vaccinated” on a regular basis by being exposed to other dogs that have been vaccinated recently. You see, for a several week period after vaccination with a modified live virus vaccine, dogs will actually “shed” particles of the virus into their environment. When another dog is exposed to the shed virus, it stimulates the immune system to produce antibodies, just the same as if it was exposed to the actual disease. Only this is much safer, since it is through a more natural means of exposure (inhaled or ingested rather than injected) and with a much smaller dosage. This vaccination through shed virus is known as the “herd immunity effect”. So as long as you keep taking your dog (over 16 weeks) out and about and expose it to other dogs regularly (parks, training classes, dog shows) it will regularly receive low-level stimulation of its immunity, which is safe and effective. NEWS FLASH! A must read!! Dr. Rogers sues state of Texas over vaccines! Catherine O’Driscoll – “What Vets Don’t tell you about Vaccinations” . > Is Your Pet Dying From Over-Vaccination Due to Vet Economics? Now for the recommended vaccine scheduleof Distemper only. Only give this vaccine if Distemper is an issue in your area – That is it for the vaccinations! If it makes you feel better, you can run titers at a year old, and every 1-3 years after that, but it is not necessary, and doesn’t really tell all that much, since titer levels will rise and fall through the dogs lifetime in accordance to their frequency of exposure. Remember, a low titer does not equal low immunity, as it is the memory cells that are the important part, and we have no way to measure those. So you can pretty safely consider any measurable titer to be proof of current immunity. Rule number two is limit the total number of vaccinations. There is no valid reason for giving the same vaccine over and over again to a puppy. The reason this practice was started is because puppies receive maternal antibodies from their dam while they are nursing, and these gradually wear off after weaning. But they wear off at different rates in different puppies, so we have no way of knowing for sure when they have worn off….it can be anywhere from 5-16 weeks, although the average is 6-10. Giving a puppy shots while it still has maternal antibodies is useless, as the maternal antibodies will “block” the vaccine and prevent immunity from being established. So vets in their infinite wisdom decided to give puppies vaccines over and over again so that eventually one will be given after the maternal antibodies are worn down. But since we don’t know when they were down, it could leave pups unprotected for several weeks, which is why vets will tell you to keep your young puppy off the streets and away from strange dogs until it “has had all its shots” at 12-16 weeks.. According to Dr. Ronald D Schultz, head of pathobiology at Wisconsin University and arguably the world expert on this subject, once immunity to a virus exists, it persists for years or life. I am told that he vaccinated his own Golden Retrievers as puppies, and then didn’t vaccinate them again. He took yearly blood tests. His Goldens are reported to have died naturally at around 15. Cats are advised to have rabies, feline leukemia (FeLV), distemper (panluekopenia) , rhinotracheitis, and calcivirus annually–and depending on risk, chlamydia, feline infectious peritonitis (FIP), and ringworm can be added. 1.. Wellness visits are important for other reasons than vaccines, such as checking for heartworm and tumors and assessing general health status. I do recommend continuing these checkups every six months, although I do not recommend annual vaccines. 2.. Rabies vaccines are required by law. There are approved 1-year and 3-year rabies vaccines. They are the same product. Please ask for the 3-year vaccine, if you opt to vaccinate your pet against rabies. I also recommend you consider finding a holistic vet that will provide you with the homeopathic rabies vaccine detox, called Lyssin. 3.. Ask for a Vaccine Titer Test: this is a how you can determine if your pet has adequate immunological protection from previously administered vaccines (puppy or kitten shots). Antibody levels can be measured from a blood draw, in place of revaccination. The type of titer that best assesses immune system’s response to vaccinesis called IFA, or indirect immunofluorescent antibody. Please discuss with your vet the risks versus benefits of the diseases you are considering vaccinating for, before you automatically assume additional vaccines are necessary. 4.. Indoor housecats should not be vaccinated annually, especially if they never go outside or have access to other cats (potentially exposing them to infectious disease). I believe overvaccination is one of the main reasons the general health of our feline patients is deteriorating. 5.. Do not vaccinate your dog or cat if it has had a serious life-threatening vaccine reaction. 6.. Do not patronize any boarding facility, groomer, training facility or veterinarian that requires you to vaccinate your pet more than necessary. Great article – thank you for this. One person asked why this information isn’t in the news. Having worked to alert pet owners to the dangers of over vaccines for the past 15 years, and having a public relations background (which means I am trained to get stories in the news), I have concluded that the media is controlled by powerful interests. Last month we sent a letter to the British press, signed by 33 vets from around the world, calling for an end to over-vaccination, quoting the research, and NO-ONE published it. Worse, our governments put pharmaceutical companies ahead of the lives of animals and humans. Years of lobbying the government to get one-year vaccines withdrawn have met with avoidance and intransigence. The licensing body in the UK – the Veterinary Medicines Directorate – is in the pockets of the pharmaceutical industry. Meanwhile, our animals die and have serious adverse vaccine reactions every day. It is a scandal, and heartbreaking to the pet owners who put their trust in a profession that cannot be trusted. Catherine O’Driscoll, Canine Health Concern. Nationally and internationally, companion animals (pets) are being over-vaccinated – a practice that is resulting in vaccine related deaths, severe illnesses, reduced longevity and large monetary costs to guardians (pet owners). The most common practice is the annual administration of rabies vaccine, based upon the oft-stated supposition that an annual booster is necessary to maintain the vaccine’s effectiveness. In reality, there is no research substantiating that practice, and veterinary schools and professional associations increasingly are embracing a triennial administration standard. A study of more than 1,000 cats and 1,000 dogs in the United Kingdom by Canine Health Concern in March 2001 showed a 1 in 10 risk of adverse reaction from vaccines! The study, which tracked over a seven-month period the health of cats and dogs vaccinated by one UK veterinarian, found that 7.54% to 12.42% of the dogs had adverse reactions within a 45-day period post-vaccination. An almost-identical number of cats – from 7.56% to 12.44% — also suffered adverse reactions within 45 days. This is quite contradictory to the vaccine-manufacture rs’ claim that less than 15 adverse reactions occur out of 100,000 companion animals vaccinated. The UK study results were reported at the 99% confidence level. Vaccine manufacturers rely on adverse-reaction statistics from the vets themselves. In our opinion many vets continue to cling to the annual rabies shot has less to do with a cautious standard of care and more to do with their economic dependence on vaccinations for fiscal solvency. This is especially true of a substantial – if not vast – majority of small vet practices (1-3 people, non-specialty, non-emergency practice). Take out 1 year of rabies vaccination and the consequential office visit– just for dogs — and the average small-practice vet’s income drops from approximately $87,000 to $25,000 — and this doesn’t include cats or other vaccinations! The Veterinarian “Shot-based Practice” Model is a systemically flawed economic approach and potentially detrimental to companion animals. Bad practice-management becomes bad medicine, resulting in unnecessary — and widespread — death, illness, reduced longevity of companion animals and unnecessary cost to owners. The vast majority of dog owners vaccinate yearly. There is an arguably safer choice –the three year rabies vaccination option — but many, many in the veterinarian community are not informing the guardians (pet owners) to the potential detriment of their animal companions’ (pets’) life, health, and longevity. Could economics be a factor in this lethargic effort on the part of many vets to provide their clients with an opportunity for informed consent? Yearly rabies vaccination is big business and materially impacts the small-animal vet practice! We can make these assumptions based upon various surveys and studies printed by animal association groups and trade associations. · Average vet has 2,500 dogs and cats (45% dogs). · Cost of vial of rabies vaccine is 61 cents. · Cost of inoculation is between $15 and $38 yearly not including office visit. · Cost of office visit is approximately $35. · Price markup on rabies vaccine: 2400% to 6200% and again, this does not include the office visit. If 100% of the dogs in the average one-vet practice are annually given the rabies vaccine= 2,500*.45 (dogs per practice) or 1,125 dogs. @$15 per shot, a net of $14.39 = $16,189. @$38 per shot, a net of $37.39 = $42,064. If the three year option is exercised (versus a yearly vaccination for rabies), then each vet loses between $32,000 ($16,000 x 2 years) and $84,000 ($42,000 x 2 years) of operating profit in each three-year vaccination period. Adding office visits (1 a year for 2 years x 1,125 dogs x $35 per visit) = $78,800 of potential lost revenue. · Median number of transactions per vet per year in 1997 was 5,102. · Net-income median for a one-vet practice before owner’s compensation as a percentage of gross income was 26.8%. Assuming $305,000, that would be$87,300 for the average 1-vet practice. If 1,125 transactions for rabies vaccine would be lost here is the impact on the one-vet practice for the two years the dog doesn’t get a rabies vaccine (assuming no replacement revenue). Source: “Financial and Productivity Pulsepoints: Comprehensive Survey and Analysis of Performance Benchmarks:Vital Statistics For Your Veterinary Practice,” published by the American Animal Hospital Association, 1998. – That a $25 rabies shot is eliminated for 1,000 dogs only in one year. (Cats are not considered and parvo virus and distemper shots would still be administered annually). – Profit on the shot is $24.39 (the cost being 61 cents). – 26% is the net profit margin. Result: Instead of 1,000 transactions (shots) yielding $24,390, the vet would have to gross $93,807 from other areas of the practice to replace that net revenue. Furthermore, using a $54 average per transaction, the vet would have to conduct 70% more transactions – 1,737 instead of 1,000 – which would mean a 15% increase in workload (the average vet has 5,100 transactions annually) just to be at the same place. Then consider the loss of office-visit revenue and take out cats, and parvo and distemper annually, and the Small Vet Shot Model indicates red ink. It appears that even at 20% of the gross revenue, rabies shots may constitute 100% of the net profits – or even worse, subsidize a net-deficit practice – of average small-vet practices. The loss of two years of shots, on which these practices seem dependent, would have a devastating economic impact if not replaced. It appears that the small-vet economic model is a “shot model,” based economically – by design or by evolution – on transactions rather than expertise. Such a model needs to be reexamined for validity of purpose and economic consequences. · And this doesn’t even consider vaccine related prolonged illness or vaccine compounded deaths or reduced longevity for cats – and doesn’t consider the impact on dogs at all! How much money would it take to persuade you to give up your television set? $3,000? What’s that? You say you have a 53″ high-definition projection TV that costs more that $3,000? Okay, would you give it up for $30,000? .An annual American Animal Hospital Survey found that 83% of companion-animal guardians (dog and cat owners) “were somewhat likely . likely . or very likely” to risk their life for their companion animal; 70% said they would spend $1,000 on treatment for a life-threatening illness or accident; 40% would spend any amount necessary. .Two other studies found that between 44% and 76% of companion animals sleep in their person’s bed.
. Midland National Life Insurance Company gives a discount on life insurance for senior citizens who have a dog, as it has been shown that dogs reduce stress (high blood pressure), routine visits to the doctor and, accordingly, medical expenses. .In a study by Dr. Karen Allen, assistance dogs were able to substitute for paid-human assistance to the elderly or physically challenged in 68% of activities, saving a net-$13,000 a year in costs. “Dogs aren’t my whole life, but they make my life whole,” wrote the late Roger A. Caras, noted broadcaster, writer and editor. Yet, our laws still classify companion animals (domesticated non-farm animals) as “mere property.” In Great Britain dogs and cats are considered sentient beings. Constructively, we are moving to recognize domesticated non-farm animals as beyond mere property in law. Several states now allow dogs and cats effectively to be heirs – via trusts set up for their care after the primary guardian has passed away. It is time to declare companion animals (dogs and cats) to be “beyond mere property” and recognize that they are not mere objects. The value of the animal-human bond, and the companionship generated by that bond, should be legally recognized beyond the depreciated value of the cat or dog. This is not “whack-o animal rights” but simple protection both for the companion animal and for the guardian. By recognizing the value of companion animals to be “beyond mere property, Next-To-Kin, ” the law could establish significant civil economic penalties for the loss of that companionship through cruelty – be it of the gut-wrenching variety or the silent, systemic, willful acts of over-vaccination by smiling veterinarians. What else would one call economically driven acts that result in unnecessary suffering, illness, reduced healthy life span, and death? As long as these $1,000,000 companion animals are legally considered mere property, there are no deterrents to over-vaccination and other types of self-serving, non-informed consent activities.